About 30 Public Motor Vehicle (PMV) operators in Port Moresby who attended the one-day gender and human rights sensitization training have committed to taking action in ending violence against women and girls, especially sexual harassment in and around the bus stops area and on the PMV buses. The training is part of a series of trainings that will be implemented by UN Women Safe Public Transport Project, funded by Australian Government in partnership with local PMV association, Road Traffic Authority (RTA) and National Capital District Commission (NCDC) to promote safety of women and girls on public transport services. The Chief Executive Officer for RTA, Mr. Nelson Terema in his welcome remarks acknowledged the partnership with UN Women, NCDC, PMV Association and reiterated the need to address safety of women and girls in Port Moresby. “This training will help to build your capacity in understanding issues affecting women and girls so you can contribute meaningfully as PMV operators. 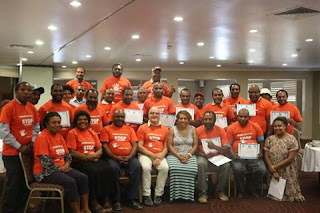 Port Moresby is changing rapidly and we will be hosting a lot of high-level meetings so it is time we have a safe reliable public transport system for men, women, girls and boys”. Members of the PMV Association present also proposed the need for deployment of security personals at bus stops and for development partners and government to work together in addressing high unemployment rates resulting in violence, especially harassment of women and girls in public spaces. UN Women Country Representative, Dr. Jeffrey Buchanan thanked the PMV Association for stepping up to work with RTA, NCDC and UN Women in promoting safety of women and girls in public spaces, especially on PMV buses and taxis.